This year’s Galena spring carnival will be held on Saturday and Sunday, March 3 and 4. The carnival starts at noon on Saturday and 1 p.m. on Sunday. Mr. Bodony said that he is putting on a kid’s carnival, so these events will not include adults. 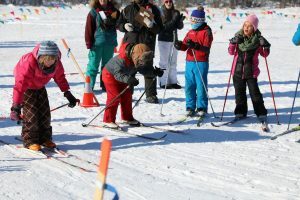 They have some great games planned such as ski races, snowshoe races, three dog races, one dog races, and kitty cat snow-go races, which seems to be very popular since they have just brought it back to the carnival. To play these games, all you have to do is show up, he said. At the end of the carnival, the academic pentathlon team will be having a quiz show pitting middle school students against some adults from Galena in the community hall to help raise money. The carnival is made possible by sponsors such as the Louden Tribal Council and the Galena Educators Association. There are also a ton of volunteers. “Our carnivals aren’t like other places, we don’t have money prizes. But we do have food prizes,” he said, adding that they do not have money prizes because the carnival about having fun and learning skills. This is the event that the Academic Pentathlon Team has been promoting for some time, in which a Galena teacher will be forced to go up against middle schoolers in a test of knowledge, in front of a live studio audience! NOTE: If there are cold temperatures (-15 or colder) and/or high winds on either day, we will reschedule for a later date, to be determined after consultations with parents.